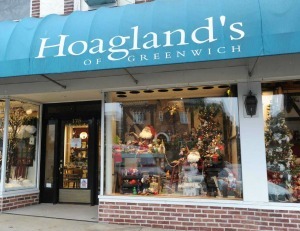 Hoagland’s has been the premier destination in Greenwich since 1937 for tabletop, home accessories, luxury gifts and wedding registries. Generations of customers have selected Hoagland’s because our unparalleled selection is as special and unique as they are. Our business has grown to offer Children's apparel and gifts available in both our Greenwich store, and our Children's store, Anna Banana, located in Old Greenwich, Connecticut. As we have done for the past 80 years, we continue to curate the finest product offerings and bring the best of the marketplace directly to you. Whether you visit our Connecticut store or experience our exemplary selection and customer service online, remember, the best gifts come wrapped in a signature box from Hoagland's!